We are all aware that precious few Lean transformations fulfill the vision of many Toyota-like managed companies in all industries. For decades, the prevailing wisdom was that better explanations of Lean, from Lean tools to Lean strategy, and more and more examples of Lean success, no matter how limited, would gain ever-growing numbers of CEO converts. But that has not happened, and so the prevailing wisdom has turned out to be wrong. Furthermore, the common analysis of what’s holding Lean back has consistently been superficial. My work, from the beginning (ca. 1994), has sought to unravel the problem of why business (and other) leaders do not adopt Toyota’s management system, or its derivative, Lean management, given its many benefits. I have persisted in this effort like no other, as I am often told, because it is important to people’s lives and livelihoods — this is something that I care deeply about. 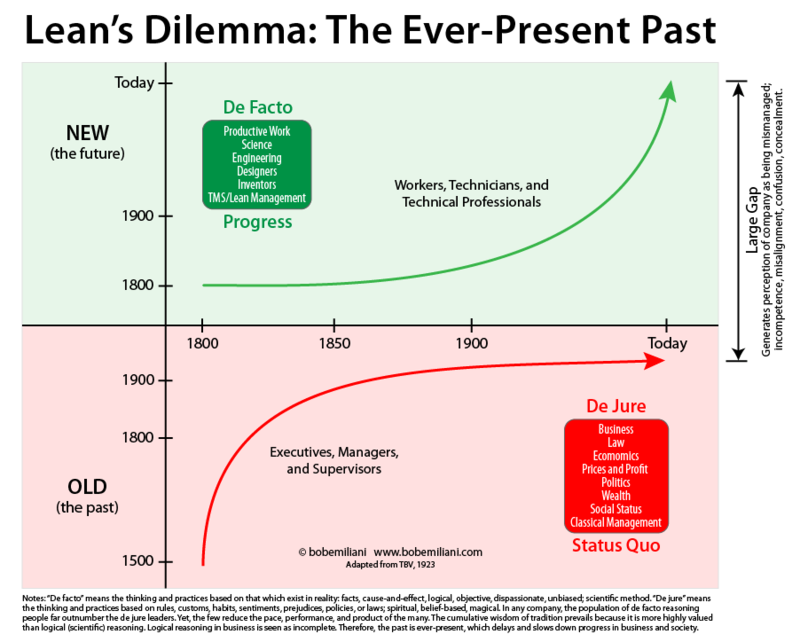 My recent research makes it clear that the past does not merely inhibit the advancement and practice of Lean, it cripples Lean. Specifically, various economic, social, political, and historical artifacts — particularly de jure thinking and practices, ancient in their origin and ubiquitous among leaders throughout time. These hold great power over the de facto thinking and practices, ubiquitous among technicians (non-managers) throughout time. This is the reason why we see so few Lean transformations. It is too bad we did not know this 35 years ago. But now we do. 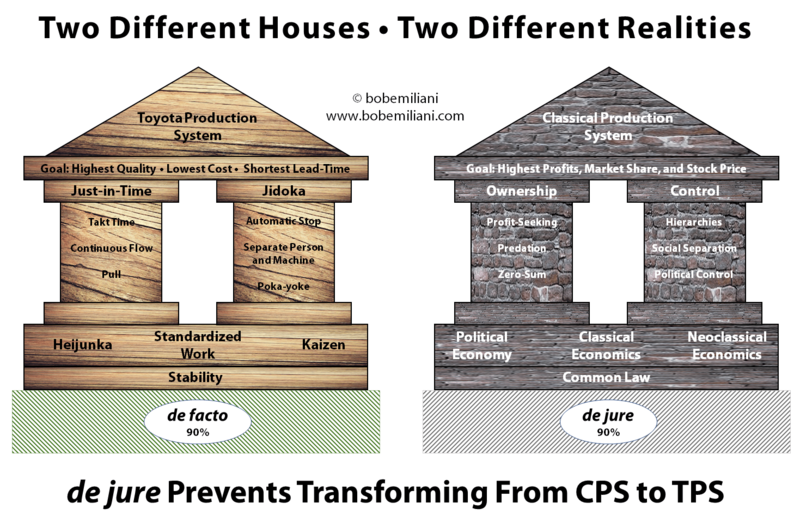 Recently, I created several images to help people understand how de jure routinely overpowers de facto. 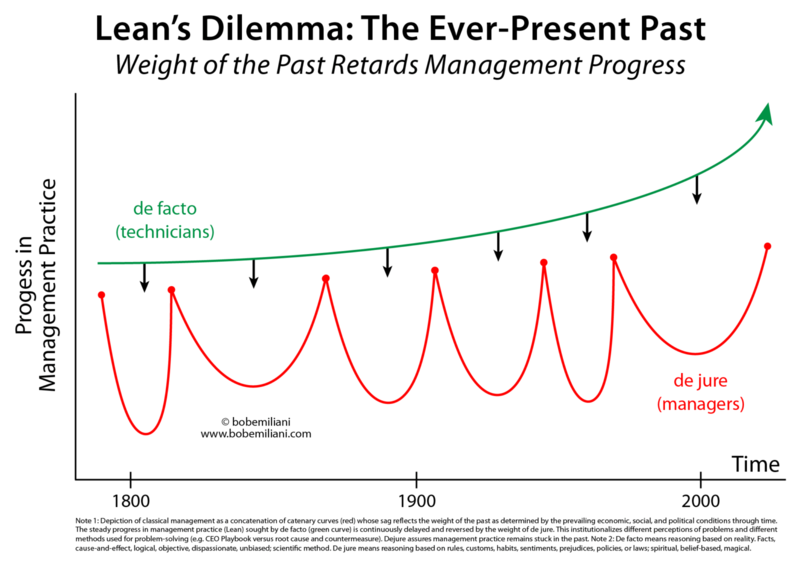 The images are collected in this blog post, and provide unique insight into why it has proven to be so difficult to advance Lean management. Click on the images below to enlarge them, and pay close attention to their details. The first image shows time fields in which de jure thinking and practice from the past diverge from de facto thinking and practice, resulting in a large gap. 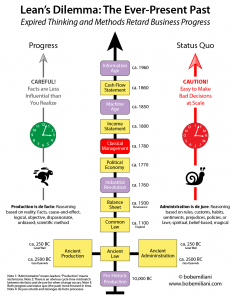 The second image illustrates how the ancient past remains with us, in force, to the present day, and highlights the time delay caused by de jure. 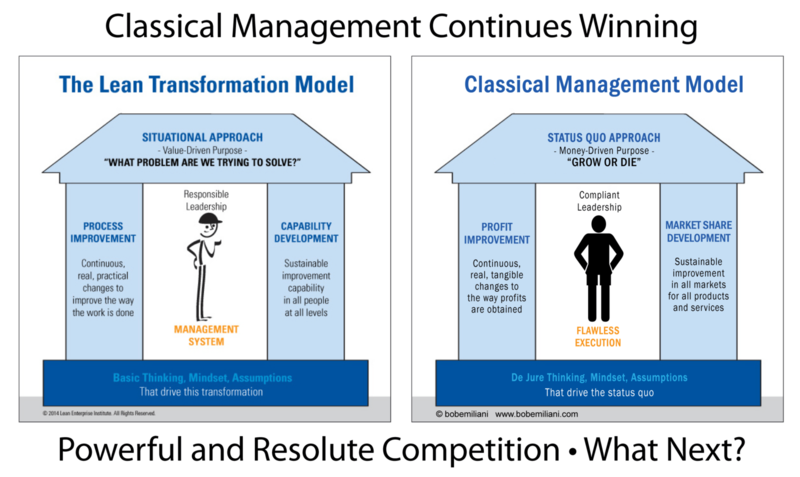 The third image illustrates how de jure drags down progress in de facto management practice (i.e. TPS/Lean). The fourth image shows relationships between de jure and de facto outcomes that result in corporate distress. 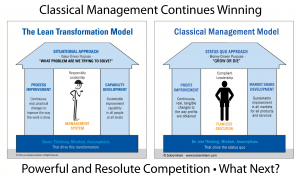 The fifth image plainly reveals the fundamental differences between Toyota’s mostly de facto management thinking and practice and other businesses’ mostly de jure management thinking and practice. 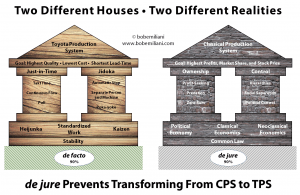 A quick example: The “price system” (price = cost + profit) thrives, while Taiichi Ohno’s “cost system” (price – cost = profit) is of no interest to executives. They find the “cost system” (and thus Lean management) unappealing. The “price system” has long been institutionalized, and executives are habituated to it. The sixth image conveys the twin message that the approach must change given the existence of new information (here and here), and that the Lean movement cannot keep doing the same things for another 30 years. 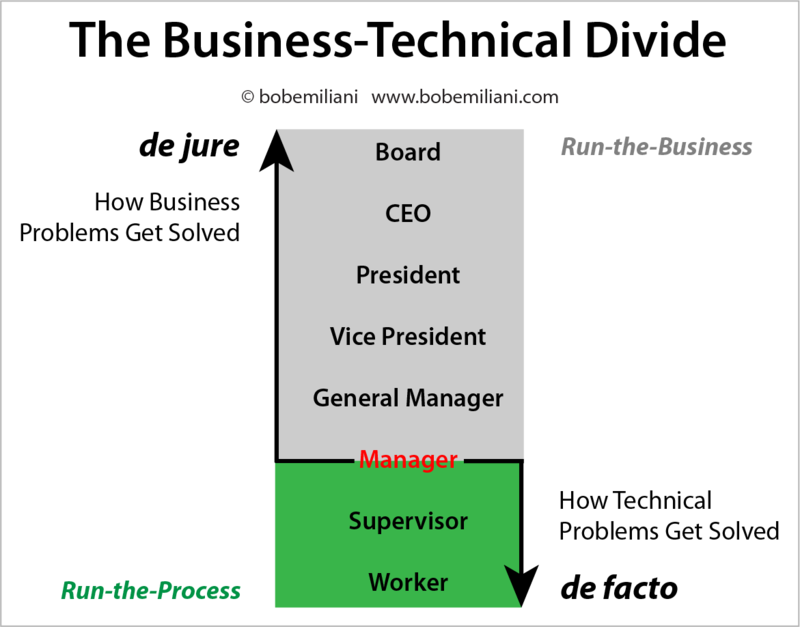 The seventh image illustrates the distinction between de jure for business problem-solving and de facto for technical problem solving, and thus answering the question why executives invariably delegate Lean to lower levels of the organization. 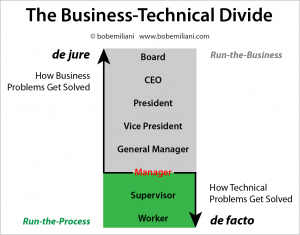 The run-the-business vs. run-the-process technical divide is a deeply entrenched mental model that functions as a strong barrier against the uptake of Lean among executives — especially, but not limited to, big corporations. Read my new book to learn the details on what is holding Lean back and some practical ways that we can move forward. 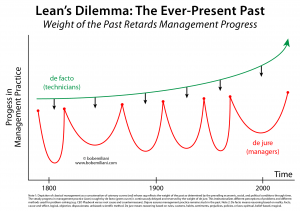 Having been involved in many attempted Lean Transformations over the last 15 or more years you have managed to encapsulate my ongoing problem solving as to why Lean is at best a short term fix. There is another significant inhibitor missing in the form of unskilled and unknowledgeable Lean Practitioners who are seeking to profit from the merry-go-round of CEO led improvement initiative activities that satisfy the “Lets make it look like we are doing something different” culture. These practitioners have settled perfectly into the de jure mindset of current business practice by filling the perceived gap in the market. The niche has been overfilled and is awash with cash. Prizing these charlatans away from their snake oil selling hit and run Lean practices will be at least as difficult as changing organisational culture towards de facto management. I’ve been saying for years that aligning to the ‘Lean’ tag damages and waters down any effort to get to the root of the problem leaving the few knowledgeable believers into picking up the less lucrative pieces. Hi Steve – I agree. 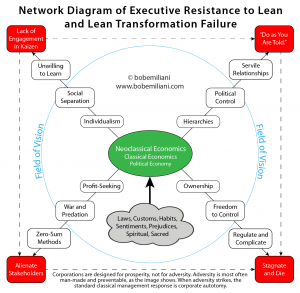 Many, if not most, Lean consultants realize that CEOs have no interests in Lean as de facto. 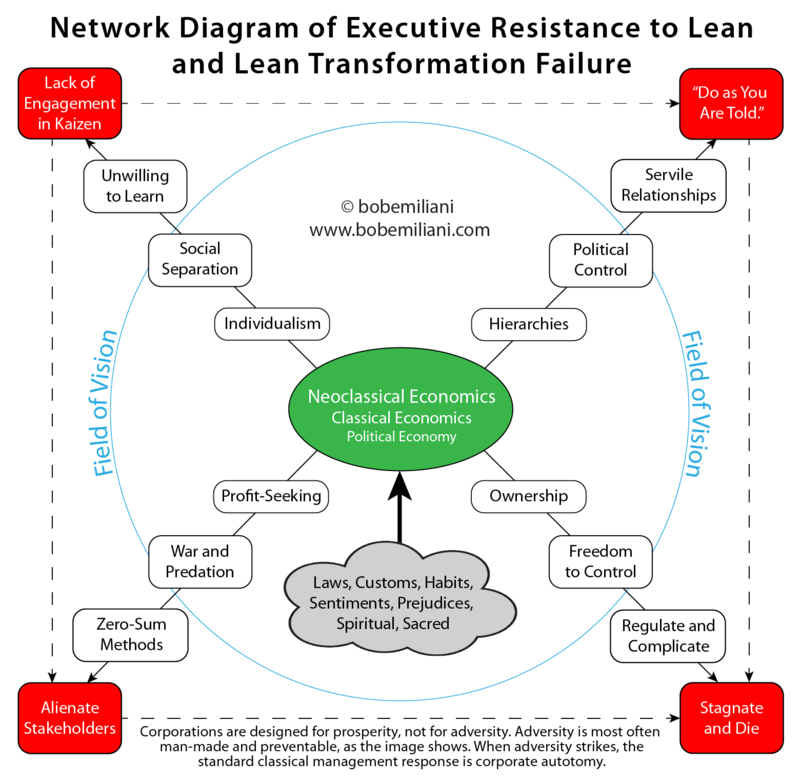 They sell Lean within the de jure framework that CEOs easily accept and are willing to pay for. The charlatans are ever-present and a sturdy feature within the business environment. 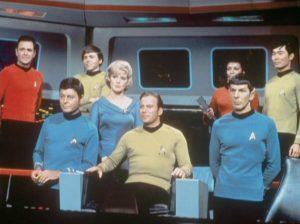 Their presence cannot be eliminated. It would help if the buyers of Lean services were smarter shoppers.